DiversityBusiness.com - CommonSource was honored at a special awards ceremony at DiversityBusiness.com's “9th Annual Multicultural Business Conference” which took place April 29 – May 1, 2009 at Disney's Contemporary Resort in Orlando, Florida, hosted by Ms. Erika Dunlap, former Miss America. 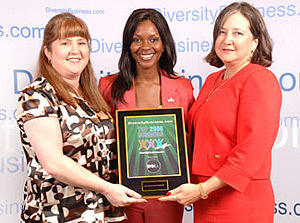 In recognition of the economic power of multicultural businesses, DiversityBusiness.com, the nations' leading multicultural internet site, ranked CommonSource Incorporated as #424 among small businesses in the U.S. and #95 in the State of Texas. The Div500 is a classification that represents the top 500 out of 650,000 diversity-owned businesses in the U.S.